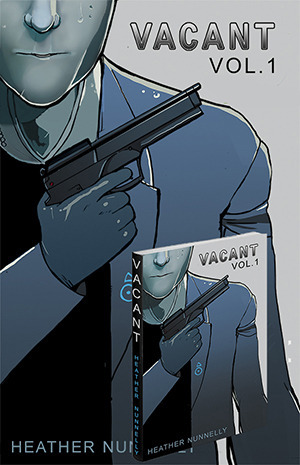 Heather Nunnelly begins with a recap of the VACANT webcomics update! Also, learn about a VACANT figurine that almost happened. Hayze gets a last name and Shadoweyes makes a guest appearance. Next up, Michelle Nunnelly enjoys the Attack on Titan anime but that’s because she tries not to sweat the small stuff. Still, she can’t help but complain about Eren yelling too much (and she wants more Mikasa!). Heather agrees… the characters need to shut the hell up. A discussion about Neon Genesis Evangelion transitions into a chat about Teenage Mutant Ninja Turtles: Villains Micro-Series – Alopex #4 (an issue where Heather did flats and color assists!). Ross Campbell uses basic color to great effect in the Alopex issue. Finally, Michelle and Heather have been playing Shadowrun Returns, a Kickstarter-funded indie game. And they like it. Heather made a custom Aex character for the game!